The category chart allows you to create a graph that has two keys for each set of values. The chart is defined by the Category Chart object. The keys and values are defined in the Category Chart Item. 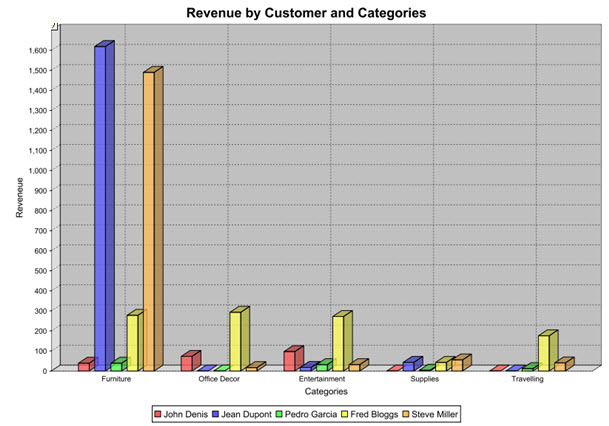 For example, the bar chart in Figure 1 presents total revenue (the value) by the Customer Name and Product Category (the keys). The default category chart is the bar chart. You can use the Draw As property to produce other types, including 3D bar, stacked bar, area, line, spider web, and waterfall. Category charts can also be output as tables. Note: Spider web charts can also be called radar charts. Note: If you select Waterfall as the chart type, the value in the last category of the data set should be (redundantly) specified as the sum of the items in the preceding categories - otherwise, the final bar in the chart will be incorrectly plotted. At the present time, the chart can only have one category.